Looking for a gorgeous mountain cabin, close to downtown, room for the entire family?? Look no further than Grin Inn Bear It. 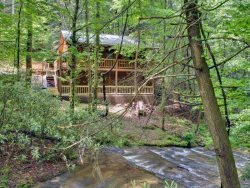 This is the perfect mountain cabin for a full family or a great couples retreat. Grin Inn Bear it os located about 5 minutes from the heart of downtown Blue Ridge. With four bedrooms and 3 1/2 baths there is room for all. There are two master suites, one on the main floor and one upstairs. The living room, kitchen, and dining room are all open so everyone can enjoy company while cooking, eating, and relaxing. The cabin has all sorts of upgrades, including upgraded kitchen, theater room, pool table, and walk in sauna making this a luxury property with all the conveniences of home....plus some! At Grin Inn Bear It you can enjoy lots of amenities. They helped me figure out where to go tubing because my daughter was too young to go rafting. We had a great time. It rained most of the time so the house had plenty of activities to keep us entertained! Beautiful cabin, very clean and exactly as described! Grin Inn Bear It is a beautiful property, very clean and well kept. Nice people, friendly and well-informed. Your associates were so helpful, courteous and friendly, and the process for booking and paying went smoothly. Enjoyed a delightful few days in great comfort and ease. Lovely cabin in a beautiful spot for hiking, bird watching, relaxing. Very pleasant experience! Quick and informative responses. What a gem of a place! This was perfect for our birthday weekend and we woke to unexpected snow Friday which made it even better. The hot tub was a nice touch! The kitchen is stocked with all cooking/baking utensils you'd need and the access to firewood was an awesome bonus. The cabin was VERY clean and decorated nicely for the holiday season. The "clean up" process before checking out was minimal. We'd love to come back again! We LOVED the cabin. It made my boyfriend's 45 birthday weekend extra special. The cabin is gorgeous and we had to fortune of snowfall the first day we were there. It created a magical feeling. I love that the kitchen was stocked so well. I brought everything I would need to be on the safe side, and everything I brought was there. Thanks for sharing the space. It's a very special place! I've stayed in several cabins since 2013 and I must say this was the best one ever along with the best service. I liked the idea of locking and unlocking with no key and not having to come back and forth to the office. The stay was amazing. I thoroughly enjoyed it. In fact I plan to come back in April 2018 and use the exact same cabin. This cabin had everything. Loved the movie room. Sauna was super. TV in every room even outside at the hot tub. Beautiful cabin with all the amenities of home. Can't wait to stay again! The members of your team are awesome. They provided information, assisted with all questions, and were very professional. Extremely professional and provided plenty of information via email. I enjoyed my stay and my boys were ecstatic from the moment we arrived to the time we departed. They loved every moment and view of the cabin. I shared and created moments with my family that I will never forget. We loved the cabin, location and beautiful scenery. Customer service was super sweet, very helpful! Its close to attractions and quite. The team was great, very helpful and sweet! Our week was a quite, yet filled with pontoon rental and tubing, not to mention zip lines and put put! Over all a great week with the family! Grin & Bear It was the perfect getaway for our family. Your rental process made everything go smoothly. We enjoyed our time as a family and seeing snow the weekend we were there. The Grin Inn Bear It is a beautiful property and we were impressed by the rooms and design.